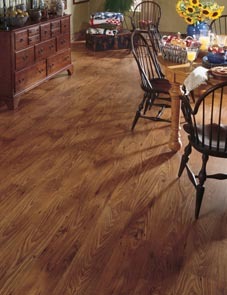 Get the look and feel of real hardwood floors anywhere in your home. At Flooring America of Scottsdale, our goal is to help you find the floors that not only look great, but also meet your practical needs. We understand that while many homeowners love the look of hardwood flooring, this material doesn't do well in moisture-prone areas like bathrooms and kitchens. That's where wood-look tile comes in. We offer many different types of tile at our showroom, and one type that is very popular is our wood-look tile in Scottsdale, AZ. It not only looks like the real deal--it's also textured in a way to make it feel almost authentic as well. We're happy to match the tile to existing hardwood floors that you have in other areas of your home. Just schedule an in-home consultation to get started. Flooring has changed a lot in just the past few years. Because ceramic and porcelain wood tiles are still relatively new trends, many homeowners don't even know it's an option. Others quickly find that it's the answer to their home flooring problems. Wooden floor tiles have the same benefits you would expect to find in any other types of tiles--they're great at repelling water, which means they're easy to clean and resistant to stains, mold, and mildew. This makes them ideal for bathrooms, kitchens, or any room that's prone to spills or moisture. Of course, just like tile, you can use wood-look tile in any room of the house, not just bathrooms and kitchens. Our products are durable and can stand up to the wear and tear that happens in high-traffic areas. Owning a home comes with a lot of responsibilities, but also a lot of freedom. You can decorate any way you want. However, when it comes to your flooring choices, you might feel a little stuck. Because there are so many decisions--from the material you use to the patterns and colors of the floors--that it can get a little overwhelming. Fortunately, you have our team to guide you to the right decision. Whether you're looking for tile that looks like wood, a different type of material, or you're unsure what type of flooring you want, talk to our sales staff. They'll listen to your needs and show you a material that meets them. After you've made your purchase decision, be sure to take advantage of our installation services to get the flawless results you deserve. Contact us today to learn more about our wood-look tile products. We proudly serve the communities of Scottsdale, Arizona, including McCormick Ranch, Gainey Ranch, Pinnacle Peak, and Grayhawk.